Since Dimitrios Theodoropoulos came into world in 1998, to be more precise May 9th, the goalkeeper is four years younger than Panaitolikos'' average player. The Greek, Modern (1453-) goalkeeper Dimitrios Theodoropoulos joined his current team, Panaitolikos (Greece), in July 2016. So far in the 2018/2019 season, he did not compete in any fixtures. He is currently seventh in Super League (Greece) and third in group Gr. 3 of Greece Cup (Greece) with his team Panaitolikos. 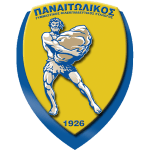 Before joining Panaitolikos, Dimitrios Theodoropoulos impressed at Panaitolikos is the first professional club in Dimitrios Theodoropoulos's career, as he did not play for another team at this level before. His longest stay in a team counts two years and 10 months in his current club. His shortest spell with a club currently counts 22 months in his latest side. Dimitrios Theodoropoulos's squad lost 50% (40% home) in Super League and concluded in a tie in 67% (0% home) in Greece Cup. The highest win streak of the last 5 matches happened in Super League with a count of 2. At Panaitolikos, he is the owner of jersey number 30. He is playing as goalkeeper in Panaitolikos together with Nikos Giannakopoulos and Dimitris Kyriakidis. Ever since Dimitrios Theodoropoulos became a professional, he has been committed to exactly one club.